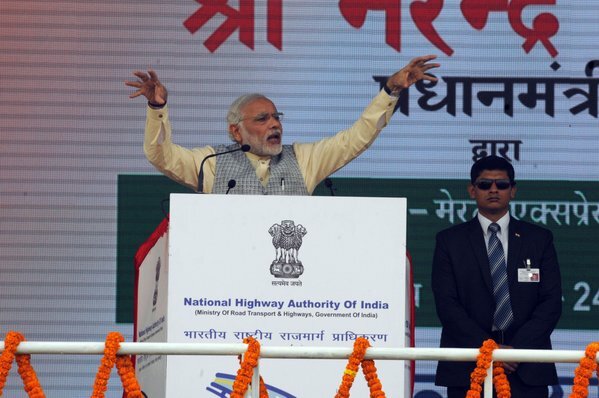 Prime Minister Narendra Modi on Thursday laid the foundation stone of a 14 lane Delhi-Meerut expressway here, calling it a national highway to development. “This is the national highway of development… It will emerge as a major factor for development of western Uttar Pradesh,” Modi said. Modi said the people in the villages aspire for good roads, as they know it is the key to development. “The villagers know if they want development, they first need connectivity through good roads,” he said. Modi also mentioned the Golden Quadrilateral project of the Atal Bihari Vajpayee government, and also the Pradhan Mantri Gram Sadak Yojana.